AIS, by the nature of the technology being used, is strictly regulated across the world by a series of international and national organisations. T his strict regulation ensures all AIS products meet minimum standards of performance, functionality and interoperability. International requirements are created by the International Maritime Organisation (IMO) who lay down carriage requirements for Class A and Search and Rescue Transponders (SARTs). The AIS standards are then created by International Association of Marine Aids to Navigation and Lighthouse Authorities (IALA) and the International Telecommunication Union (ITU). 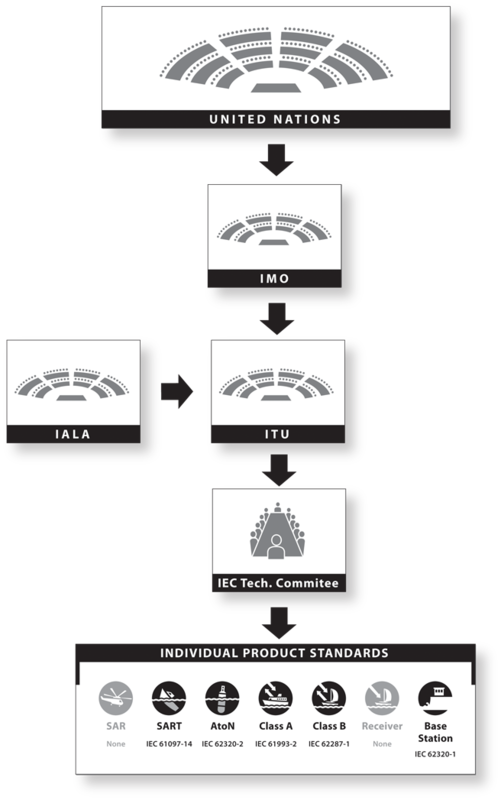 The International Electrotechnical Commission (IEC) creates test standards for AIS following regulations laid down by IALA and ITU. It is then up to national bodies to interpret those standards when creating their own approvals. However, countries can take those regulations further and create their own national standards which products need to meet in order to be sold in those countries. Contact your country's governmental maritime department for more information on their AIS standards and how they are approved.